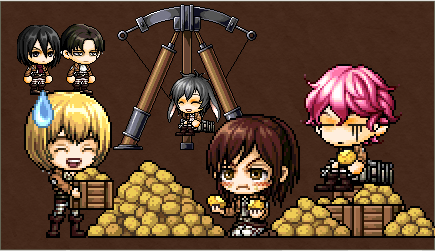 With v159 Attack on Titan for MapleStory, players get to experience the thrill of being a member of the Cadet Corps. The Cash Shop however goes further by letting Maplers turn their MapleStory Mesos hunters into their favorite characters with special MapleStory items. From January 21 to February 17, Maplers can head to the Limited Time Specials category of the Cash Shop to get Attack on Titan Surprise Outfit Boxes. Selling for 3,400 NX a piece or 34,000 NX for a bundle of 11, these will randomly give players uniforms from the popular anime. 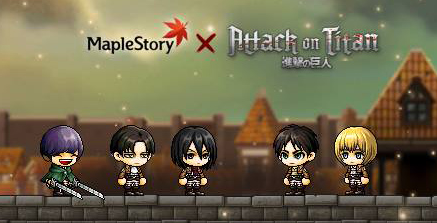 Gather MapleStory Mesos while wearing Cadet Corps Uniforms, Scout Regiment Uniform or any of Eren’s, Mikasa’s or Levi’s Scout Regiment Uniform. Note that while the box randomly gives out a uniform, the items are permanent. Get new Attack on Titan themed items from the Attack on Titan Surprise Style Boxes! These boxes will be on sale from January 21 to February 17 in the Limited Time Specials category of the Cash Shop. Each box gives players a chance to get one of eight items. These include Blade, Sasha’s Delicious Bread, ODM Gear, Cleaning Mask and more. One Attack on Titan Surprise Style Box sells for 3,400 NX. For a nice discount, you can buy a bundle of 11 for 34,000 NX. Note that the items are given out randomly and can be traded as long as they have not yet been equipped. If you already have the uniform and gear of your favorite Cadet Corps member, why not turn your character into them with themed hats? Attack on Titan Surprise Hat Boxes are on sale in the Cash Shop from January 21 to February 17. Each box has a chance to give Maplers one of eleven items. This includes the faces of Eren, Mikasa, Armin, Levi and more. Players can also get these characters sitting on their head. For a full list, click here.